The moment you set your eyes on the new Hyundai Elantra you feel like you're looking at something rather special, especially in the eye catching Marina Blue shade. As I was taking in the design, I was quickly directed towards the white car beside it. "This is your car, sir. The blue one goes for a mall display. Both run the same drivetrain, so the drive experience will not be any different." assured the Hyundai rep. No worries, the white car looks good as well and I was far more excited to see how this new car drives thanks to its brand new engine. Yes, the 2.0-litre Nu petrol engine is all-new. The 16-valve, four cylinder motor gets dual variable valve timing and makes 152PS/192Nm. This makes it 3.5PS/14.5Nm more powerful than the older 1.8-litre petrol. 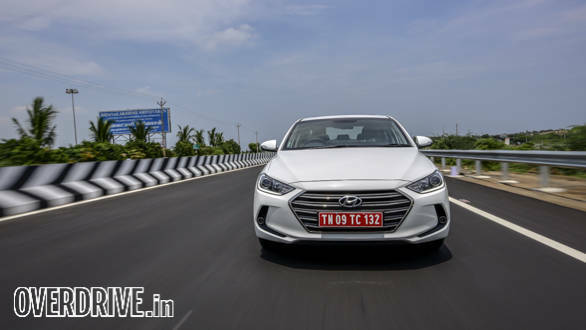 The new engine is paired with a 6-speed torque converter that gets a manual mode like the outgoing Hyundai Elantra but now also offers Eco and Power modes which make small changes to the power delivery. It is a quick revving motor but the responsive nature doesn't really translate into quicker acceleration. While performance is brisk it isn't quite up there with the turbocharged engines from either the Skoda Octavia or the diesel-only Chevrolet Cruze. Manual mode makes things more involving but it is clear that this car prioritises unstressed performance over tyre destroying acceleration. At a claimed fuel efficiency of 14.62kmpl for the auto, it is 0.3kmpl more efficient than the outgoing 1.8-litre engine. 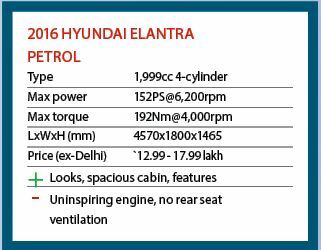 Also on offer is the reliable and smooth 128PS 1.6-litre common rail diesel engine from the Hyundai Creta and Verna. There are no changes to this motor and like the petrol, it is available with a choice of 6-speed manual and automatic transmissions. Matching the new engine is a thoroughly revised design. Hyundai has taken the overtly curvaceous shape of the previous Elantra and sharpened things considerably. For starters, the grille is now a single, hexagonal, chromed unit. The headlamps lose the body hugging curvature from before and now pack LED DRLs flanked by HID projector lamps. The Indian-spec Hyundai Elantra doesn't get the LED foglamps that the North American model does. In its place is a projector fog lamp within the same boomerang-shaped housing. The side profile looks similar to the outgoing car but the roofline at the rear is even more coupe-like and ends directly in the boot section which packs an integrated spoiler. Hyundai have adopted a similar boot opening technique seen in the new Skoda Superb. With the key in your pocket, wave your foot under the boot once. Announcing that the car has sensed this movement, the indicators will blink four times after which the boot opens. It's a nice option when you have both hands full and need to open the boot. Tyre size is the same 205/60 R16 but they are now low rolling resistance Hankook Kinergy rubber wrapped on tastier looking wheels. 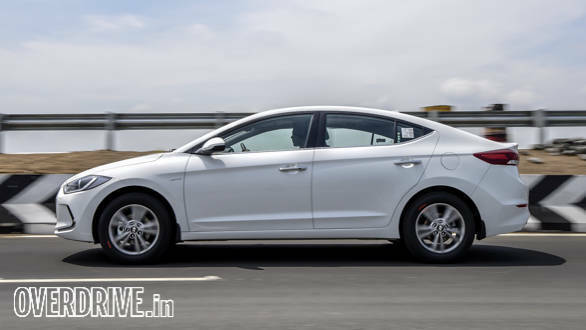 This new Hyundai Elantra is slightly longer than the outgoing car at 4,570mm, 5mm more in width (1,800mm) and lower in height (1,470mm) by 5mm. The ground clearance too is lower by 2mm at 165mm. 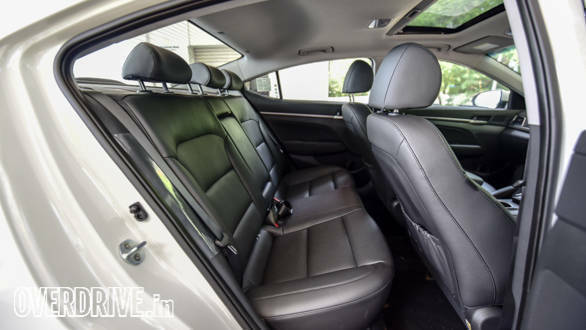 Keeping in line with recent Hyundais, the new Elantra packs a handsome cabin. The upholstery uses black leatherette while the dash gets a silver finish. The glovebox is a cooled unit and, as is the norm nowadays, the car gets an 8-inch touchscreen infotainment system. 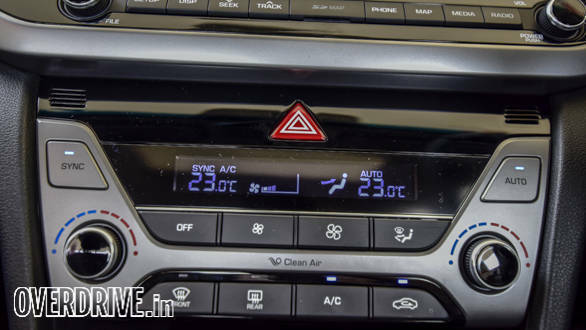 The user interface is new and improved over the units in the Creta and the screen is also bigger and crisper. 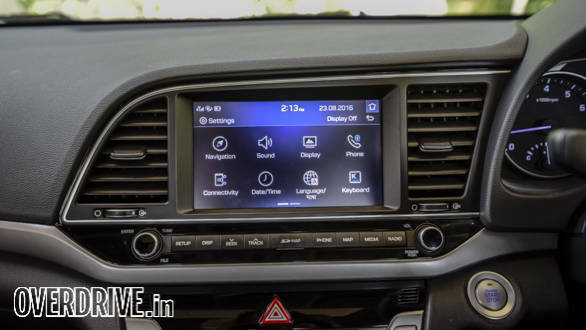 The system also gets sat-nav as well as both Android Auto and Car Play - a first for a sub-20 lakh car. The new 3-spoke steering wheel has audio controls, cruise control, Bluetooth calling and trip computer related functions. The analogue dials themselves are new and house a plethora of information like distance to empty, instant fuel efficiency average driving time, average speed and so on. I particularly liked the way the cabin was put together with no uneven panel gaps or any rough edges. Dual zone climate control continues but now comes with a sync function which matches driver and passenger side temperatures. The driver now gets a 10-way adjustable power seat but there is no memory function. The top model offers an anti-pinch sunroof. The much-loved ventilation for the front seats is carried forward and works like a charm to cool your lower back and back-side. Adding ventilation function for the rear passengers would have upped the luxury quotient by a fair bit. While the front seats are comfortable, the rear could do with better underthigh support. The stylish sloping roof also cuts into the headroom for taller occupants (as is evident from the photos) but this should not be of bother to passengers below 6ft. The 458-litre trunk is a significant improvement over the older car's 420 litres but is still smaller than most rivals. Under the brand new style is a modified version of the previous-gen platform. 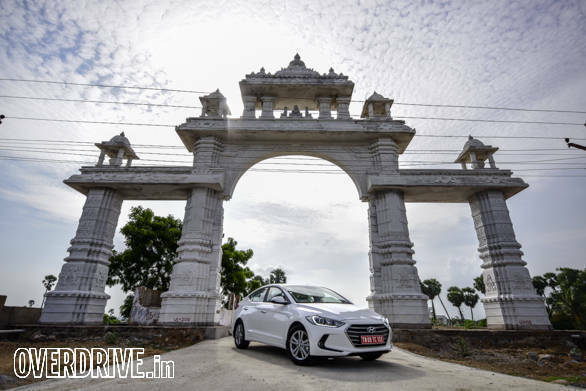 While we drove the car entirely on perfect tarmac it was quite clear that the new Hyundai Elantra has a firmer set-up over the previous car. Body roll feels more controlled and high speed handling is confident. However, we'll have to wait to for the full road test to see how the new Elantra deals with poor roads. 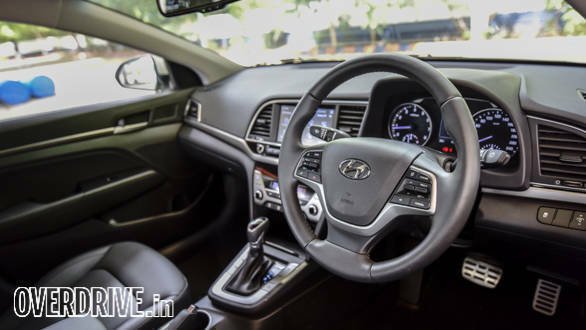 As with most Hyundais, the steering is feather light at slow speeds but it offers a decent amount of weight at higher speeds. NVH levels are excellent and very little road or engine noise invades into the cabin, even at highway speeds. There are disc brakes all around, backed by ABS and EBD. 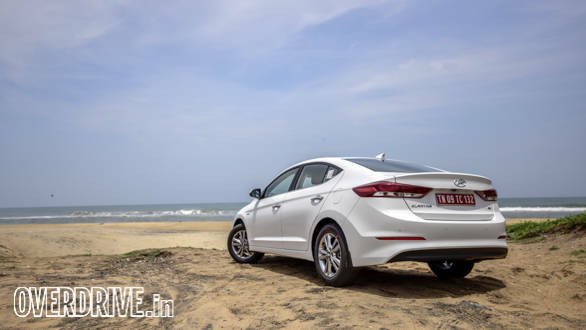 The Hyundai Elantra has been priced quite aggressively, starting at Rs 12.99 lakh (ex-Delhi) for the base petrol manual variant while the top-end SX(O) AT that you see here is for Rs 17.99 lakh. The diesel lineup ranges from Rs 14.75 lakh  Rs 19.19 lakh. This makes it more affordable than the corresponding Toyota Corolla Altis variants by about Rs 75,000. 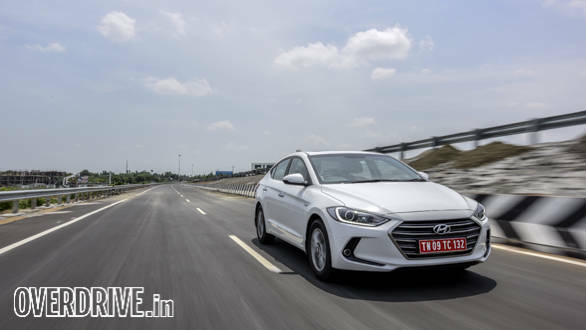 We are yet to put the new Elantra through the full set of tests but can already confirm that Hyundai has a significantly improved Elantra on its hands. Hopefully it will give this struggling segment the boost it so badly needs.